In my previous post the sentiments expressed were that “dogs are a blank canvas” and that the dog’s personality could be shaped by how the puppy was raised. However much we would like to believe this as it would make our lives as trainers much easier, it is not entirely true. Nurturing is all very well, but what about the hand Nature plays in the outcome. In other words what factors went into making up the personality or temperament of the pup before it was born, during its neonatal phase of development and during its critical period of development. Ongoing research is showing that it is actually neither one or the other, but rather an interplay of genetics and environment working together to determine how your pup turns out. I sometimes come across dogs who have very fearful, anxious or shy personalities. There is often some improvement with a programme of desensitization and counter-conditioning, but in many cases the general skittishness continues, particularly when confronted with a novel event or strange environment. Rescue dogs often display this type of personality and because often nothing is known of the dog’s history, early abuse is often blamed. There might be a history of abuse, but fearfulness in dogs is more complex than that. 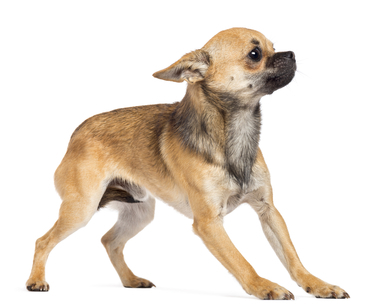 Fearful posture – notably crouching and leaning back, ears back, tail tucked. With all animals fear is necessary as a self-defence mechanism. The fearful, cautious puppy will often out-survive his bolder, more confident brother and so live to produce offspring who tend to be cautious. There is therefore huge selective pressure on the evolution of fear. Knowing this, and furthermore realising that there are a number of ways that a pup can become fearful or anxious, believing that abuse is the only reason for the dog or puppy’s fearful behaviour is questionable. Genetics: There is ample evidence that animals (rodents, dogs, humans) can inherit a fearful, anxious disposition from its parent or parents. Prenatal Environment: A stressed pregnant female will often give birth to pups with little or no resilience to stress. Maternal Behaviour: There have been suggestions that the dam’s fearful behaviour will have an effect on the pups’ behaviour. No one knows for sure what the mechanisms are of this. It couldn’t have been genetics but it could possibly have been some nutritional component in the dam’s milk, social learning, or just being around a stressed mother. Early Environment: If the pups’ early environment is impoverished in terms of lack of social contact with humans or other animals or experiences, the result will often be a fearful and anxious young adult. With a rescue puppy that exhibits fearful behaviour, the best we can do is to make sure there is a comprehensive programme of socialization before the puppy is 16 weeks and continued exposure throughout the dog’s life. If a purebred dog is desired make sure that the puppy’s dam does not exhibit fearful behaviour by visiting her prior to whelping. Be aware that if she is genetically fearful puppies raised by her will be influenced by her genes, by any stress she experiences during her pregnancy and by being reared by a fearful dam. For myself my ideal pet/companion puppy is one who is “middle of the road”. The one extreme would be a puppy who is fearful of everything novel in spite of extensive, careful socialization. The other extreme would be the crazy, fearless pup that dashes headlong into every novel situation, often at great risk to himself physically. My ideal would rather be a pup that approaches each novel situation or person with a certain amount of caution until he or she ascertains that there is no threat to his wellbeing. Coppinger & Coppinger. Dogs: A new understanding of Canine Origin, Behaviour and Evolution. (University of Chicago Press 2002). Jean Donaldson. Oh Behave! : Dogs from Pavlov to Premack to Pinker. (Dogwise Publishing 2008). You are currently browsing the Louise's Dog Blog blog archives for October, 2014.